We left the last update in late March with a major project still to do before de-wintering Lea Crest (getting rid of winter clutter that is!). 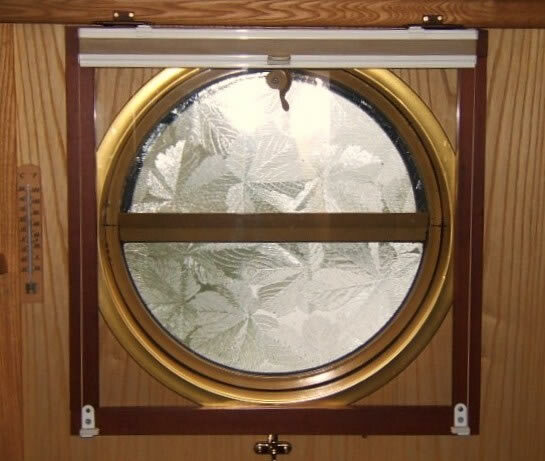 Lea Crest is totally different in the cruising season and we do envy those who have alternative accommodation during the winter months as they can leave their boats in readiness for cruising. Having said that, there are jobs to do when leaving a boat unattended. Still, we wouldn't change it for a proper job, as we often say. Presumably this boat will need a little extra work by the local authority (digging up the tarmac perhaps?) before he can get under way. 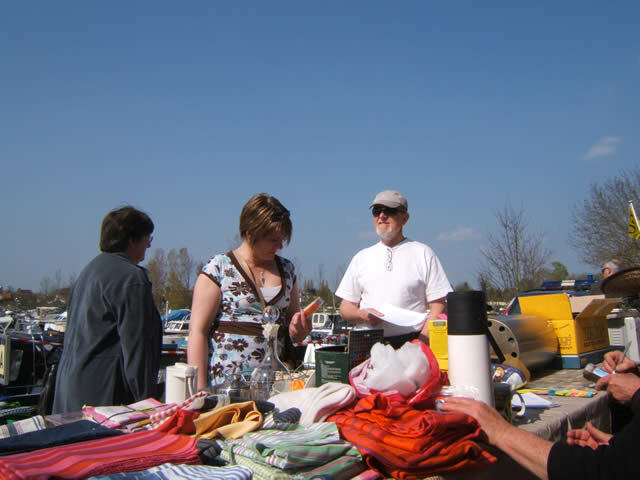 April 17th and 18th saw an open day weekend in St. Jean de Losne. This wasn't the best spectacular we have ever attended bearing in mind what is described for boating tourism as "the biggest and most important canal port in France". One French lady asked at our stall "is this it?" How embarrassing! Last year, the stalls went all around the port and according to our winter jogger Richard that is about a mile. It was unfortunately a bit of a non-event and yet another embarrassment for the town as also this winter the town's tourist office was temporarily shut down. There were money problems apparently involving a rumoured bankruptcy of 40.000 euros. The ladies who worked there were working for no pay over the Christmas period. COME ON ST. JEAN DE LOSNE! GET YOUR ACT TOGETHER! It was soon time for our friends John and Pat to have their boat HODDY DOD's bottom looked at. 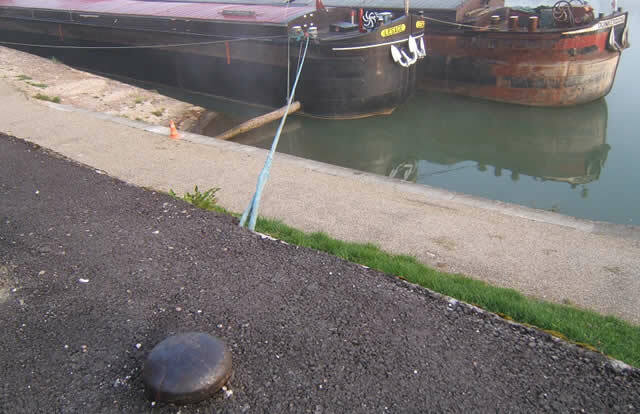 They used the dry dock at Atelier Fluvial for the job and all went well. Atelier Fluvial seem to be very professional and have a good reputation. As always, Philippe, who works there, checks the underwater situation before any boat is left high and dry in the dry dock. Its like a scene from the 50s film "The Cockleshell Heroes" when Philippe gets into his rubber suit, as you can see in the next photo. NO LIMPIT MINES ON HODDY DOD PLEASE. 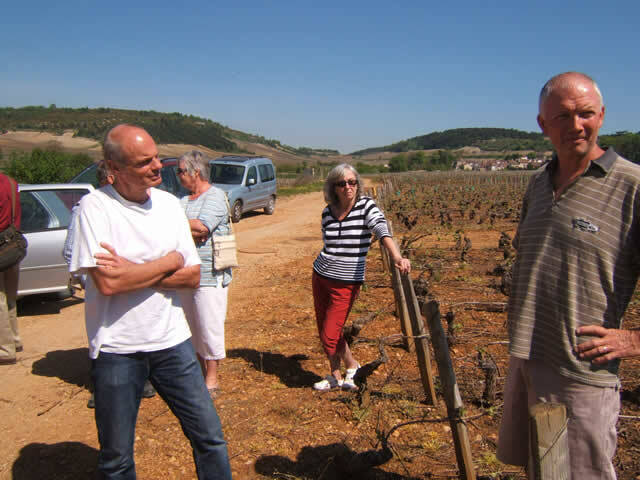 Late April brought us a long awaited trip to Meursault and a visit to the vines. Organised by our good friend, Steve Pajak, it was a really great day out. We had beautiful weather in a wonderful part of the world, tasting some of the best wines. We felt very privileged to be invited. 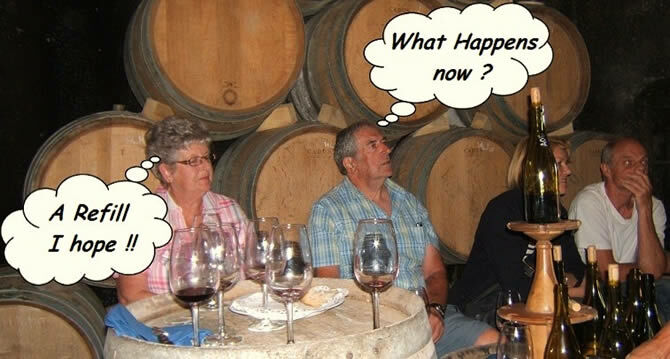 Of course it was something of a learning curve for us all but maybe, after some time, we will know it all, like the winegrowers in the colonies seem to think they do! Well, with John's bottom freshly blacked, we were invited on board HODDY DOD with our mutual friends Tony and Gaye (of NOMADE) to celebrate. 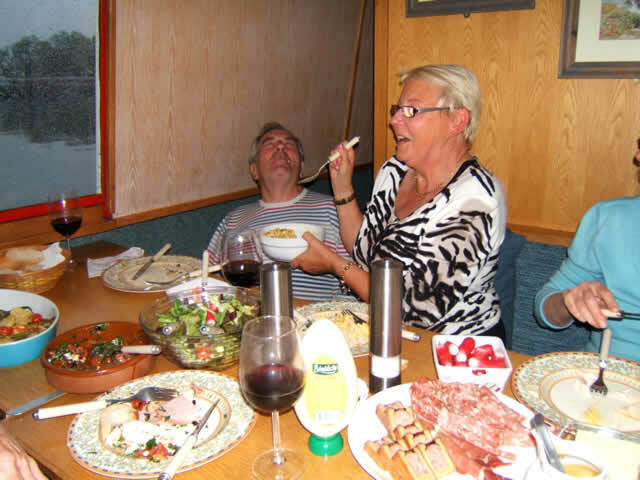 It didn't seem to take too much giggle juice before Gaye thought that John needed feeding up. We are not sure if it was laughing or food that was getting the better of everyone but, as always, a good night was had by all. Finally, with all projects finished, it was time to start our cruise. 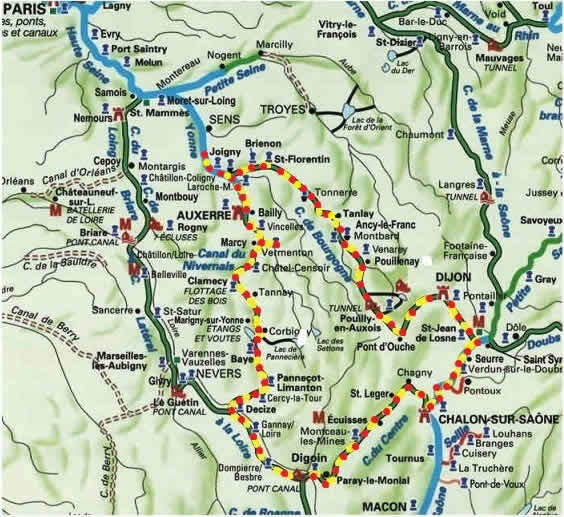 Unfortunately we simply don't have the power to go South to the Canal du Midi and get back up the Rhone again, although we do have friends down there who love it. But we have met people who have come away from the Midi saying that it is too hot, too expensive and too busy. And this year we hear that the boat hirers are sending lots of their boats South. Lets just hope that there will be room for us if/when we do decide to bite the bullet and go down. So where to go this year? 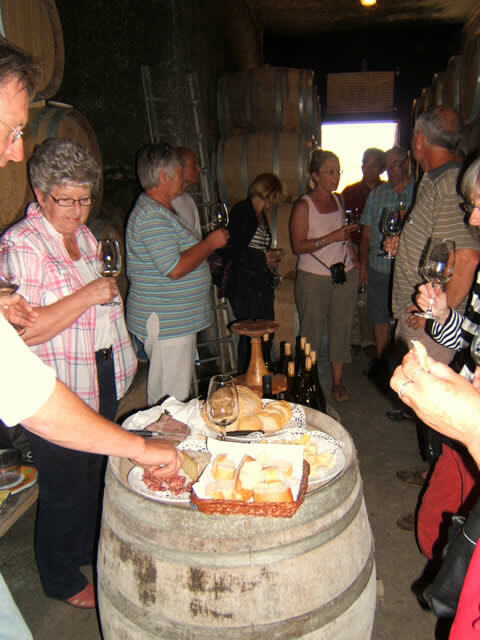 Well in 2005 we cruised the Bourgogne canals and rivers and both felt that it was time to re-visit them. But this time we will travel in the opposite direction (clockwise). 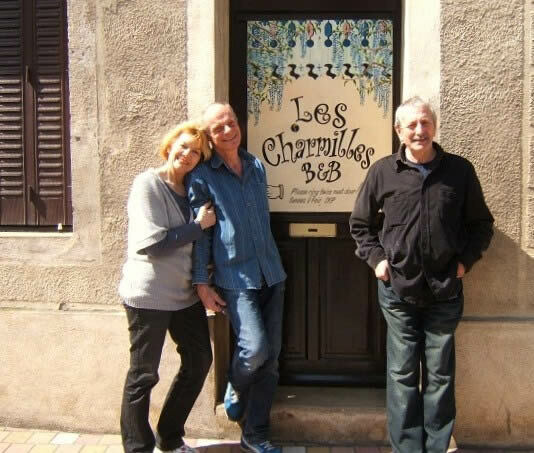 One little place we knew of downriver, not on the beaten track, is Lechatelet. 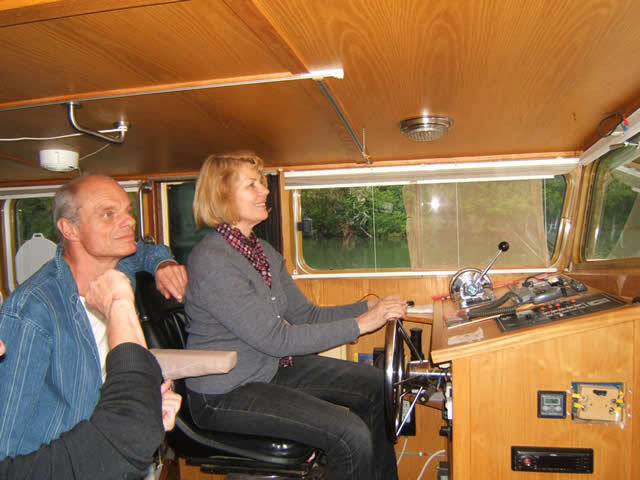 We had arranged to take Sylvie and Gérard for a little trip as they hadn't ever gone through a lock and we thought it a good idea to let Sylvie try boat piloting. 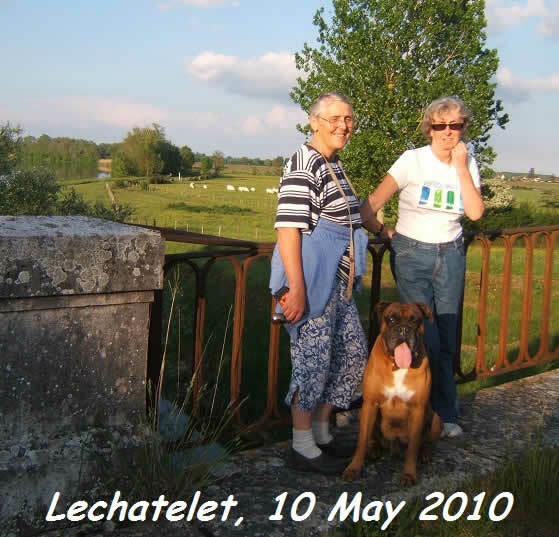 So Lechatelet was an ideal first port of call. It's quite funny really as from St. Jean de Losne to Lechatelet by car is about 15 minutes, whereas by Lea Crest it takes 6 1/2 hours!! Lechatelet is a sleepy backwater heading back up the Sâone from Seurre towards the barrage (dam). The pontoons are a little rundown, but it's a lovely relaxing port and eventually we stayed for 3 nights to unwind, as it were. Sylviane, our friend from Charrey sur Saone had also arranged to call and see us whilst at this little port. She knows the area well and takes her dog out there regularly for a walk.. 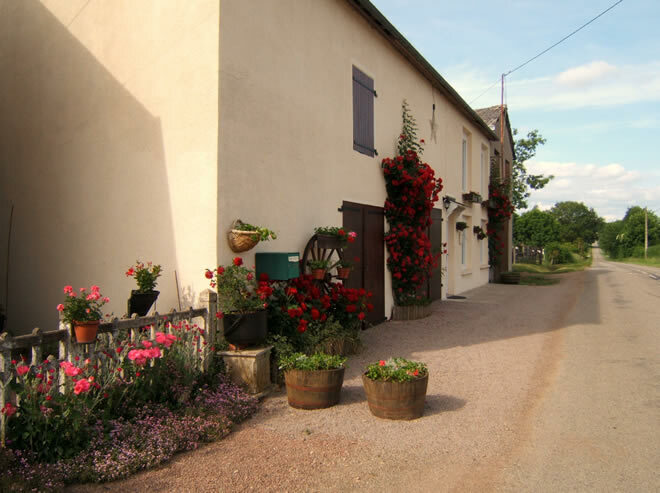 It wasn't long before we arrived at one of our favourite places, Fragnes, the first stop on the Canal du Centre. The halte there really is a credit to such a small village. 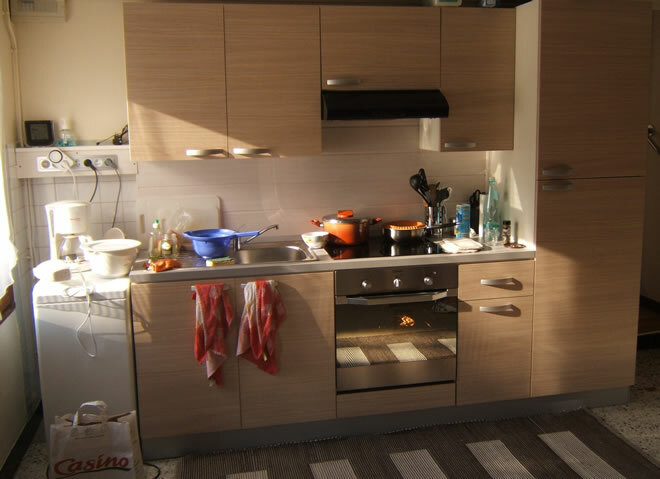 The amenities, designed to be used by all, are really first class, well maintained and very reasonably priced. We met a lady who was obviously new to boating. 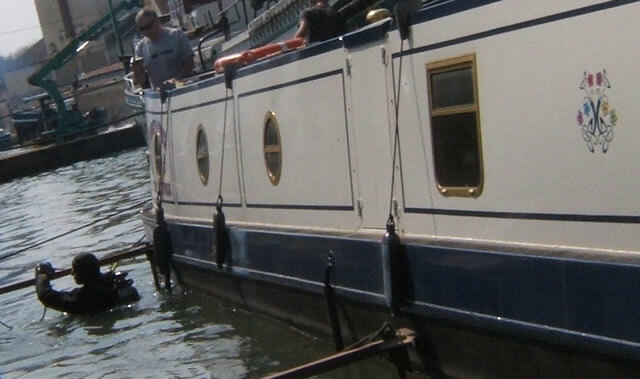 She had just pulled in on a hire boat that moored up next to us and came over looking rather puzzled at the water and electric box. 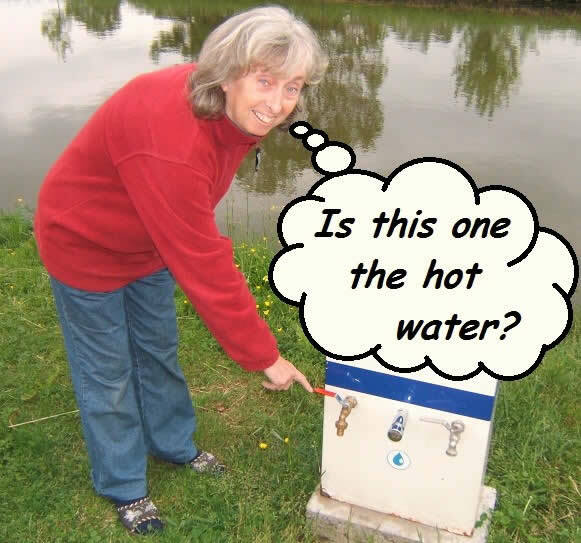 "Is the tap with the red handle the hot water?" she asked!!!!! I explained that it wasn't and held back a suggestion that it could be for the vin rouge. 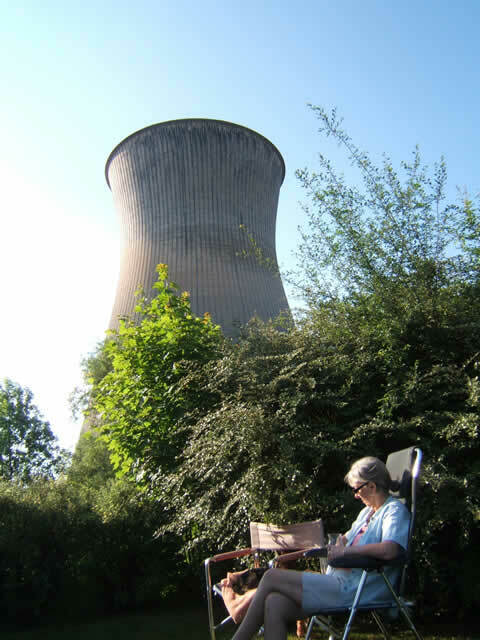 Further along the canal, at Montceau les Mines, we moored outside the old power station instead of in the port. Surprisingly, it is a very pretty spot and much better for Gromit. But we did spot some friends moored at the port, John and Sue on MARCO POLO. As we passed, John followed on his bicycle armed very kindly with a packet of chocolate Hobnobs. Now, that is what we call a treat! Many thanks John and Sue. Hope your birthday bash went well. 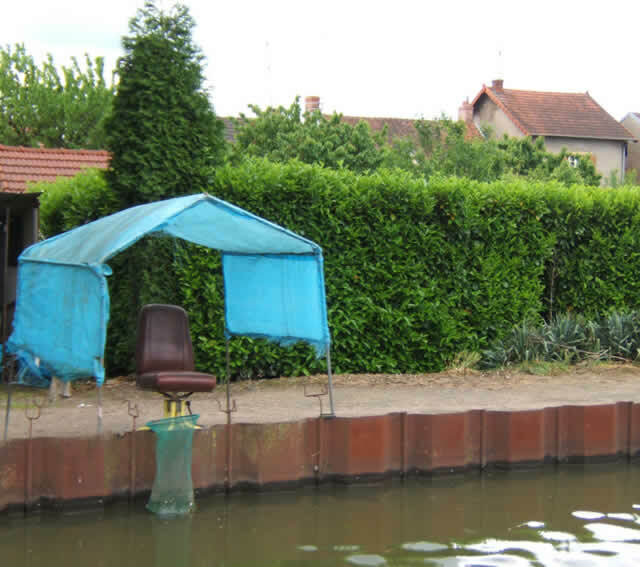 The French national pastime seems to be fishing and with the set-up in our next photo, it's an all weather activity. Personally we think an armchair would be even better and surely there is room for a small coffee table under there. The 3G key has worked really well on this trip. Even perfect Skyping without sounding like Norman Collier. Brilliant! 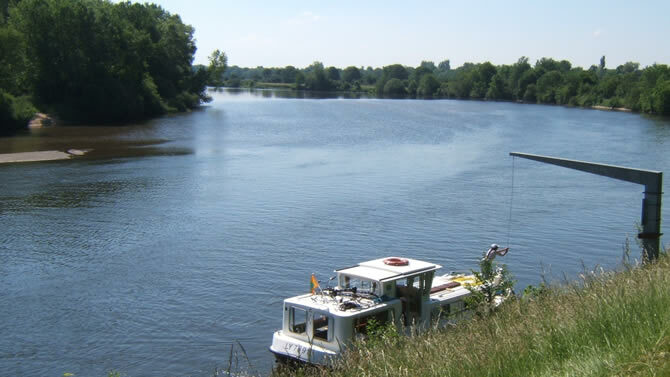 Our next picture is of a hire boat we spotted coming off the river Loire to join the canal Lateral a la Loire. As you can see, it's a very technical operation, until you have learned the ropes that is! I spoke to a friend in England the other day who complained about internet shopping (not that he does any himself I might add). He said he had seen the staff at a large supermarket chain shopping for on-line customers. "How do they know which cauliflower to pick? I like ones with plenty of greenery. I've seen them picking ones with very little greenery", he said. Well look at this one I picked myself Roy. I just happen to like the greenery too! For a few days we moored where we wouldn't annoy anyone whilst working on our summer project of secondary double-glazing throughout the boat. Although wood is very expensive over here we did stumble upon a bargain in the winter. At the time it was so cold that the woodpile was frozen and we had difficulty separating the planks. But the wood is good and hopefully, the finished article will be acceptable. It will take most of the summer to complete but we will gain the benefits in the winter months. And we think it looks pretty good! Well we can't possibly do an update without giving this fellow a mention. 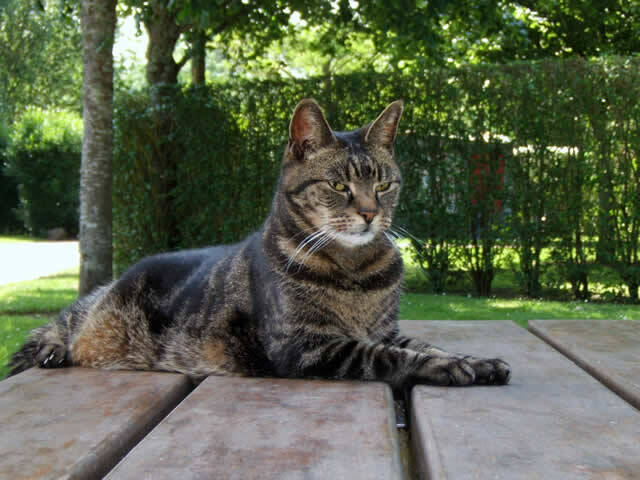 He's 14 years young and apart from a little stiffness in his elbows, he is doing great. It's a pity that we left our afternoon walk a little late to see these roses in the sunshine. They were so brilliant, even in the shade. This is at the port we are in now, Panneçot. (Just for info, the squiggle under the C in Panneçot makes it sound like an S). Once again we were the only boat in the harbour. There is water and electricity, no shops or bars and, although it is the 8th of June, the adjacent campsite doesn't open for another week. It's quite surprising how many mooring spots are free in this part of the cruise, even if they don't offer "hot" water. We are not sure when the parties will start but there isn't any rush as we are enjoying the peace tranquillity. After our walk it was time to eat, with a new meal for us. 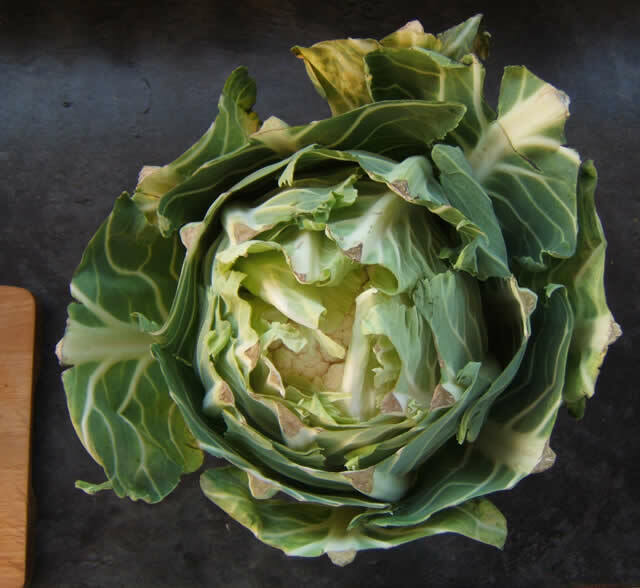 It is a cross between "Poulet Gaston Gérard" and "Lapin a la Moutarde", both classic Burgundian dishes. So we would probably have to call it "Lapin Gaston Gérard". Would this count as fusion food perhaps? And would you believe it, Pamela eating rabbit!!! When you are out in the wilds of Burgundy the freezer we bought 2 summers ago is worth its weight in gold. Sorry about that picture, we hadn't even combed our hair. To finish our update off, here are some of the things we got up to in the winter. 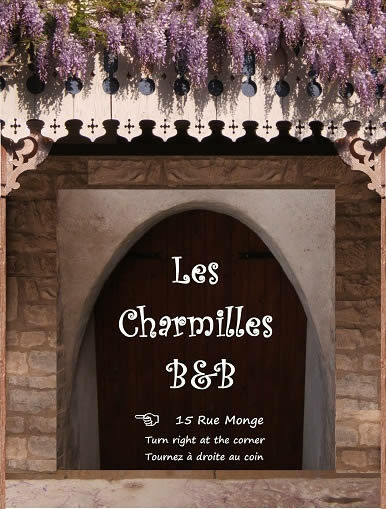 For Sylvie and Gérard's B&B, a sign to replace the piece of A4 paper on their door. They really liked it so next was a computer generated montage of parts of the house to make a sign for the rear of the property. 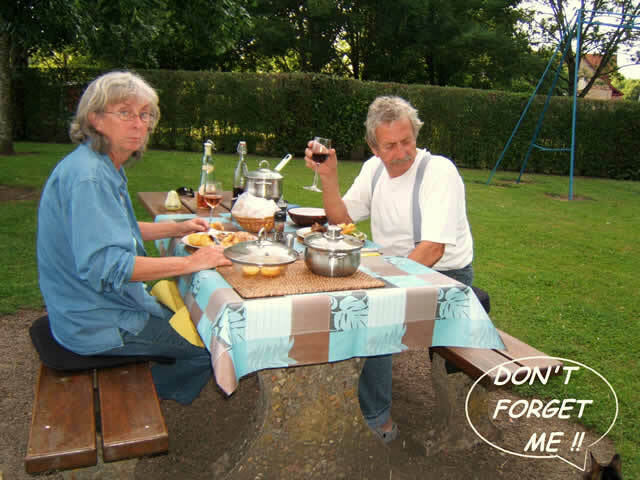 For Jean-Pierre and Ilse, the fitting of a new kitchen in their small house across the river in Losne. 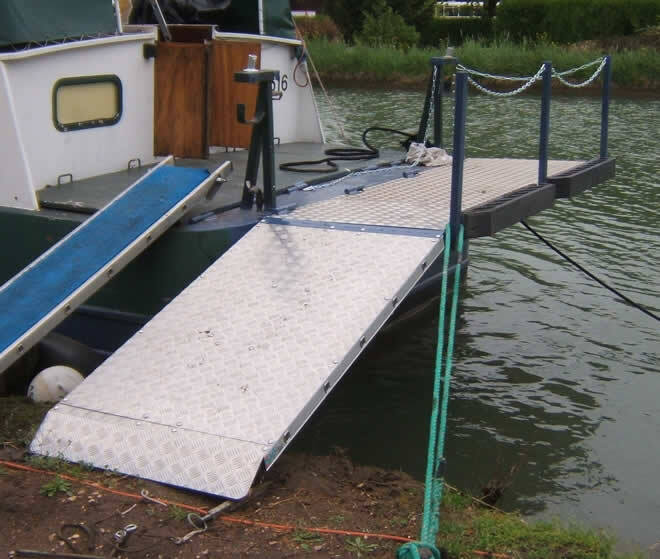 Last, but certainly not least, for Jean-Pierre and Ilse's boat SAUCONNA (the Roman name for the river Sâone) a new platform, to carry their motor scooter and generator. Unfortunately we didn't get any photos of Janna's finished project of 4 paintings for Sylvie and Gérard. Gérard is going to get frames for them and give them pride of place in his Salle d'Été (summer kitchen). 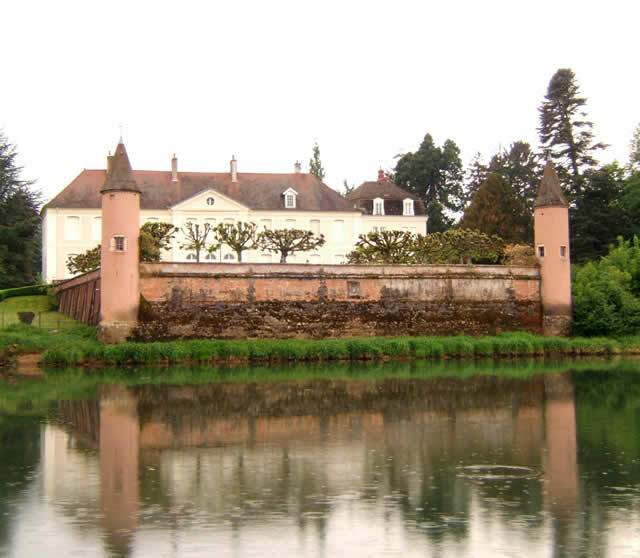 So we will get pictures of them on our return to St. Jean de Losne. This coming winter we hope will be more relaxing with far less large projects.